Collections by Weiser offers five handle sets to choose from. These handle sets offer solid forged brass construction and Grade 1 cylinders for uncompromised security. The classic round shape and intricate lines of the Wickham knob complement and enhance a variety of design styles. This privacy knob/lever is best used in interior bed and bath applications where privacy is required. Both knobs/levers are locked or unlocked by turn button inside. The outside knob/lever can be unlocked by an emergency key. The Venetian Bronze finish is hand-rubbed to reveal unique bronze highlights and provides a rich and warm complement to the product's style. 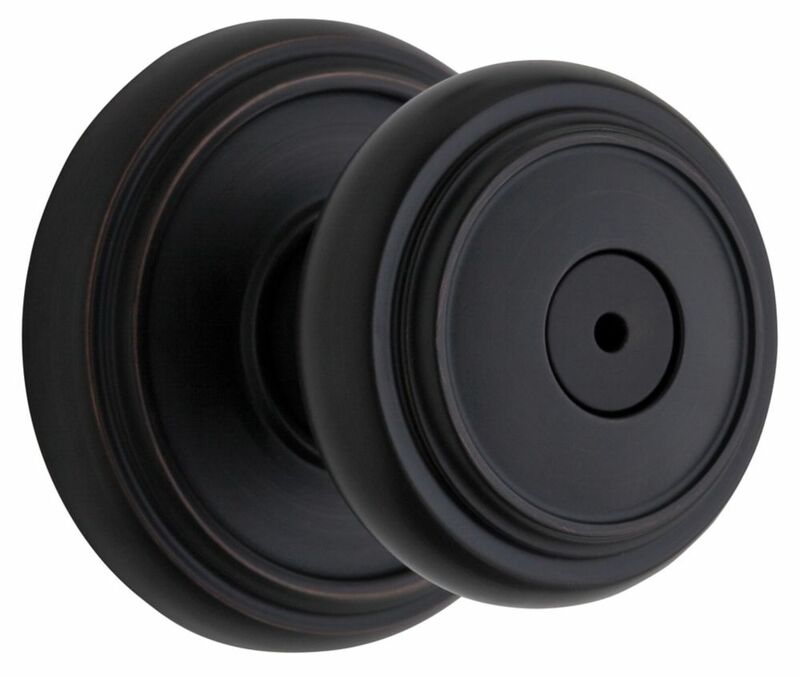 The Amerock BP29460CORB Abernathy 1-1/16in(27mm) LGTH Knob is finished in Clear/Oil-Rubbed Bronze. With an air of elegance, the Abernathy collection adds depth and dimension to any space. Accented by four distinct finishes, the stunning jewel-like Knobs add a classic touch resulting in a sophisticated and timeless look. The Oil-Rubbed Bronze finish is a rich, dark brown old world finish with striking light and dark accents. With a contemporary flair, this dynamic design will work with a range of home styles. Venetian Bronze is a warm finish that adds class to any room and will be a noticeable upgrade in your home. As well, you will get the same easy-installation and reliability that comes with any Weiser product. Get Smart. Get Weiser. Wickham Venetian Bronze Privacy Knob Collections by Weiser offers five handle sets to choose from. These handle sets offer solid forged brass construction and Grade 1 cylinders for uncompromised security. The classic round shape and intricate lines of the Wickham knob complement and enhance a variety of design styles. This privacy knob/lever is best used in interior bed and bath applications where privacy is required. Both knobs/levers are locked or unlocked by turn button inside. The outside knob/lever can be unlocked by an emergency key. The Venetian Bronze finish is hand-rubbed to reveal unique bronze highlights and provides a rich and warm complement to the product's style. Wickham Venetian Bronze Privacy Knob is rated 5.0 out of 5 by 2. Rated 5 out of 5 by paolo from Good quality Good quality doorknob and easy to install. Spend the little extra to upgrade to this line, well worth it. Rated 5 out of 5 by digimer from Solid, excellent feel I wanted new door knobs for my house. I plan to build my own solid oak doors later, but the existing door knobs were bad enough I decided to get the new knobs now. So I wanted something understated, but solid and strong for the new heavy doors once I get them. These door knobs are hefty, much heavier that normal knobs (I'm guessing they're cast instead of stamped). They have very little play/wiggle and they just feel excellent in the hand. I'm very impressed!